Nahnybida, Serhij [Сергій Нагнибіда] – airman, active in community affairs; born on 16 September 1898 on the Nahnybida estate (Poltava oblast, Ukraine; at that time – Kremenchuk county, Poltava gubernia, Russian Empire); died on 21 January 1987 in Derby, England; ashes buried in St Andrew’s Ukrainian Cemetery in South Bound Brook, New Jersey, USA. Nahnybida attended a gymnasium secondary school in Kremenchuk. At the outbreak of the First World War he enlisted in the Imperial Russian Army, and in 1916 became an ensign. 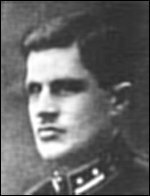 During the 1917-1920 struggle for Ukrainian independence he served as an officer in various units of the Army of the Ukrainian People’s Republic (UNR). From 1920 to 1923 he was interned along with the rest of the UNR Army in camps in Poland. After obtaining political émigré status in 1923, he worked as a forestry supervisor in Volhynia and, from 1925, as a driver in Warsaw. In 1928 he contracted to serve in the Polish Air Force, on the basis of an agreement, between the UNR government in exile and the Polish government, concerning the assignment of UNR Army officers to the Polish armed forces. In September 1939, after the fall of Poland at the beginning of the Second World War, he escaped with other members of the Polish armed forces to Romania, from where he was evacuated to France. When Germany invaded France in May-June 1940 he was evacuated to the United Kingdom where he continued to serve in the Polish Air Force under Royal Air Force command (see Ukrainians in the Polish Armed Forces under British command). In 1945 he was promoted to the rank of major. After the war he was involved in plans to create an Association of Ukrainian Soldiers in the Polish Armed Forces, which was established in 1946 as the Association of Ukrainians in Great Britain (AUGB). He was a member of the AUGB executive (1946-8) and of the AUGB Governing Council (1948-9). He was also involved in the early stages of the establishment of the Ukrainian Autocephalous Orthodox Church (UAOC) in Great Britain (1947), the Association of Ukrainian War Veterans in Great Britain (1948-9) and the Federation of Ukrainians in Great Britain (1949-50). From 1951 to 1972 he was conductor of the choir of the London parish of the UAOC.